— Optimus Prime. This quote shows that inspiration can come from anywhere. Figure 1: Illustration Showing that Refraction Increases the Perceived Distance to the Horizon. While doing some reading on lighthouses, I needed a formula to compute the distance to the horizon as a function of height. This formula would give me an idea of how far away a lighthouse could be seen. where s is the distance along the Earth's surface in kilometers and h is the height of the observer in meters. This formula assumes that light moves strictly in straight lines. You will also see it in the form , where is the radius of the Earth. This formula assumes that light is refracted and travels along a circular arc. Allowing for refraction means that light will curve around the geometrical horizon (Eq. 2), which means that we will see objects that are just beyond the horizon. Using Eq. 2, we will compute a horizon distance that is about 7% further than predicted by Eq. 1. Figure 1 illustrates this point. While I frequently see refraction modeled using Eq. 2, I have not seen anyone go into the details of Eq. 2 -- I am sure this analysis exists -- I just have not seen it. So I will dive into the details of Eq. 2 in this post. I have seen the Eq.1 derived in a number of places, so I will not repeat its derivation here. The material presented in this blog is similar to that presented on mirages. I have included some mirage information in Appendix B. Light bends because of density differences in the atmosphere. These density differences are caused by (1) altitude and (2) temperature. Of course, temperature and pressure vary with time. To get some idea of the effect of refraction on the distance to the horizon, we need to assume a "typical" atmosphere. We can derive Eq. 2 using the typical atmosphere assumption, but we need to understand that those conditions are often not present. Show that the air's index of refraction is a simple function of density. Develop an expression for the rate of change of air's index of refraction. Develop an expression for the radius of curvature of a refracted light beam. Develop an expression for the arc length along the Earth's surface that a refracted light beam will traverse. Simplify the expression by assuming typical atmospheric conditions and common units. Because air's index of refraction is very close to 1, physicists usually talk in terms of refractivity. The refractivity of air is defined as , where n is the index of refraction. One common formula for the refractivity of dry air is given by Equation 3 (Source). P is air pressure [kPa]. T is the air temperature [K]. is the wavelength of light [cm]. Using the ideal gas law, we can show that temperature and pressure are closely related to density as shown in Equation 4. V is the volume of air. m is the mass of air. nm is the number of moles of air = , where is the molecular weight of air. R is the universal gas constant. Equation 4 states that the ratio of P/T is proportional to (R and MWAir are constants). This means we can restate Equation 3 in the simpler form shown in Equation 5.
is a function of the wavelength of light. The index of refraction is a function of wavelength, as is shown in Figure 2. Note how the shorter wavelengths have a larger index of refraction than the longer wavelengths. Figure 2: Air's Index of Refraction Versus Wavelength. For this post, I will assume that the wavelength of light is fixed and that is a constant. For light to refract in the atmosphere, it must encounter air with an index of refraction that varies. The air's index of refraction is a function of its density, which varies with altitude and temperature. We can express the variation of the atmosphere's index of refraction using Equation 6.
n is the air index of refraction. is the atmospheric lapse rate, which is defined as the rate of temperature decrease with height (i.e. ). Deriving this expression requires manipulation of the ideal gas law. The derivation is straightforward but tedious. I have included it in Appendix A. This value of is known as the autoconvective lapse rate. This rare condition means that light does not refract. It occurs over surfaces that are easily heated, like open fields and deserts. This condition requires that the rate of temperature decrease with altitude to cause an air density increase that exactly cancels the air density decrease with altitude. The change of index with altitude is normally negative because the air density increase with altitude associated with decreasing temperature is not enough to cancel the air density decrease with altitude. Since light bends towards regions of higher density, light projected straight from a lighthouse will refract toward the Earth's surface under normal circumstances (as shown in Figure 1). We can compute the autoconvective lapse rate as shown in Figure 3. The value I obtain here can be confirmed at this web page. Figure 3: Calculation of the Autoconvective Lapse Rate. Assuming a typical atmosphere, we can model the path of a refracted beam of light in the atmosphere as an arc on a circle. Figure 4 shows a derivation for the radius of curvature for a refracted beam of light. The radius of curvature will be constant (i.e. a circle) when is a constant. Figure 4: Derivation of the Radius of Curvature Expression. In the case of a lighthouse beam, . This means we can write the refraction radius as . We are going to model the refracted light beam as moving along the arc of a circle of radius larger than that of the Earth. Figure 5 illustrates this situation. Figure 5: Illustration of the Refracted Light Beam Moving Along the Arc of a Circle. 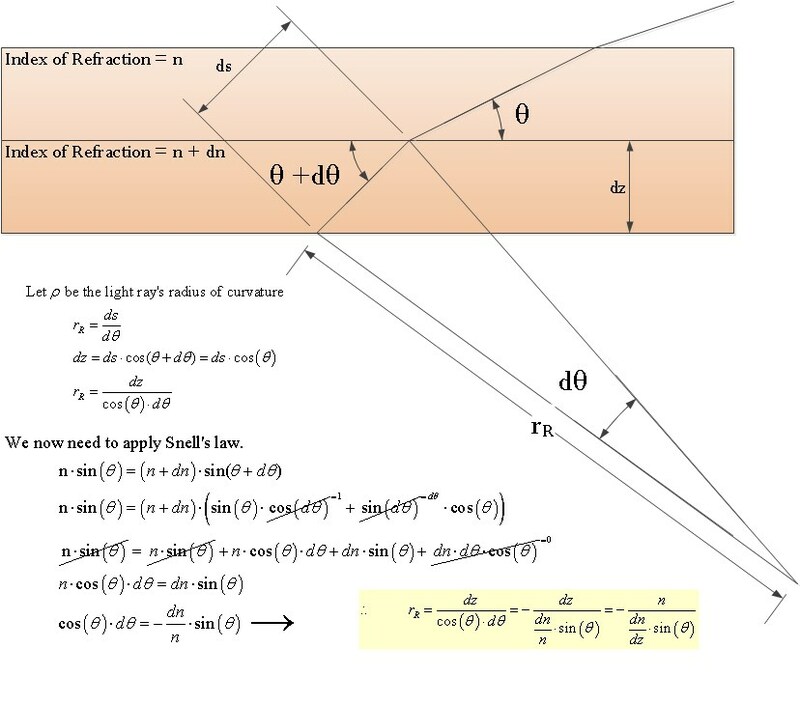 Given the geometry shown in Figure 4, we can derive an expression for the arc length upon the Earth's surface that the light beam traverses as shown in Figure 6. Figure 6: Derivation of Formula for the Distance Traveled Along the Earth's Surface By Refracted Light Beam. Equation 7 shows the key result from the derivation in Figure 6. Notice how Eq.7 can be viewed as Eq. 1 with an enlarged Earth radius of . I see refraction often modeled by engineers who simply use Eq. 1 with an enlarged Earth radius. The radius used depends on the wavelength of the photons under consideration. Figure 7 shows how I obtained Equation 2 from Equation 7. Figure 7: Equation 2 from Equation 7. While the derivation was a bit long, I was able to derive Equation 2 from first principles. The derivation shows that the final result is sensitive to the choice of lapse rate, which varies throughout the day. I should note that the use of a refraction radius that is a multiple of the Earth's radius is often applied to other types of electromagnetic signals. For example, radar systems frequently use a "4/3 Earth radius" for refraction problems (Source). The refraction radius for radar is different than for optical signals because the index of refraction in the radio band is different from that of optical signals. 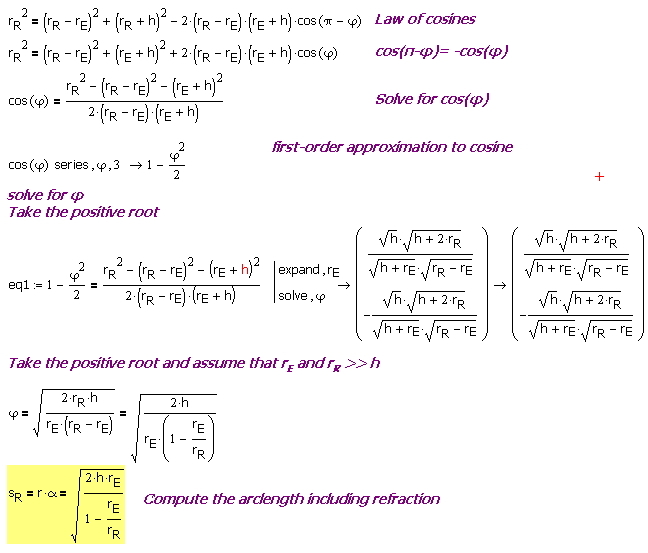 Appendix A: Derivation of Rate of Change of Atmospheric Index of Refraction with Lapse Rate. Figure A: Derivation of Rate of Change of Atmospheric Index of Refraction with Lapse Rate. Appendix B: Excellent Discussion of Index of Refraction, Lapse Rate, and Mirages. I really like the way this author discusses mirages (Source). Figure B: Excellent Description on the Formation of Mirages. This entry was posted in General Science, Navigation, optics. Bookmark the permalink. Thanks for this derivation. It's very helpful for something I'm working on. At the bottom of figure 7 you restate equation 2, however the square root term is SQRT(h/m) instead of simply SQRT(h) as shown above. How/why does the (/m) term drop out? It does look confusing. That is actually the units notation from within Mathcad. This notation is a bit strange, but it says that this equation works with h in units of meters. The nice thing about Mathcad and this unit notation is that if you input the number with units of feet, Mathcad will convert it to meters automatically. What I am telling you is that the "/m" is a Mathcad unit thing and is not present in derivations as normally done by people. Thanks for this great article. This will help me with a problem I have been working on for several years. Being a radar engineer, I had completely forgotten that the changing altitude will change the index of refraction of air. Wow, what a bonehead! This is an optical problem, however, so your lighthouse example turned on the ole light bulb. I hope I can learn more from your blog. You'll most likely understand the problem if you chose to look at the web site. Thanks again. I am glad it helped. I worked on dual mode systems (radar and IR). I had the effects of refraction beaten into me hard. Ok, please be gentle with me.. I stumbled upon your article after reading.. Your post couldn't be more relevant, sadly, my understanding of your post couldn't be more relative to a dimwitted rabbit who tried to cross a motorway at night (freeway if your American!). Possibly (very possibly) you are very busy, and don't have time to check every link a "cranky commentor" sends you. But just perhaps, you are intrigued enough to take a look down the rabbit hole and see if what is there has any mystery to it. Maybe it is an open and shut case, like the majority believe and with a flurry of calculations you would be happy to tie these light refraction loopholes closed once and for all? I wrote a new post that I hope addresses your question. I usually don't respond to questions on psuedo-science stuff, but the answer gave me a good problem to use for playing with a different computer algebra tool. Hi there, where is the article you mention here? I am having a problem determining which article you are referring to? Could you give me some additional information? How does refraction keep the horizon at eye level no matter how high an altitude I'm at? I think what you mean is "why, when I look right at the horizon, is it in the center of my vision" -- and I think we all should know the answer to that one. I don't think refraction is responsible for keeping the horizon at eye level as you rise in altitude. It is actually the case that the horizon does drop, but due to the size of the earth the drop is not noticeable with the naked eye, and certainly not noticeable over the time shown in various films that claim to show this. For example at an altitude of 20 miles you would expect the horizon to have dropped less than 6 degrees. Hi could you debunk this? Sorry forgot to hit the "notify me of follow up comments" icon. From wiki article "Atmospheric refraction" near horizon is 35.4′. From geometry we have cos(theta)=R/(h+R). Here h is the height of lighthouse, R - the radius of Earth. Then distance to horizon l_withoutRefraction=R*tan(theta). Great article. Although i have a major issue with how atnospheric refraction operates in real life. You acknowledge that we need to assume a "typical atnosphere". Well, such an atmosphere does not exist. Consider that at any observational height one cares to consider (under say 1 kilometer), there is no uniform temperature and density relationship as a function of height. Therefore if atmospheric refraction functioned as we are told, we would expect not to see a static predictable horizon line, but rather one that undulated, flickered or (wobbled) and changed depending on time of day, season etc. Such observations have NEVER been made. The horizon remains a straight line at eye level irrespective of height. Furthermore, in addition to the temperature gradient not renaining constant, it is extremely small at heights under 1km, so that when you apply the calculations you typically get a much smaller extension of the horizon than what has been observed time and time again. Please show your math, I can see the horizon wobble all the time -- go to any desert where the differential effects are sufficiently large for the human eye to observer. Or build a powerful telescope, even way up high, and see if it turns out you need to correct for atmospheric aberrations using lasers to probe the exact refraction effects under current conditions and correct for them (HINT: you do, and we do). Very interesting. Terrestrial refraction is not like atmospheric refraction where the change of conditions is regular. Therefore terrestrial refraction can be measured but not calculated. This is a great derivation, thank you. I was curious about something from a novel, and decided to try extrapolating this to a dyson sphere. However, the calculated arc length of the refracted light path from -n/n' is smaller than the radius of a dyson sphere of radius 1AU (go big or go home). I just wanted to get a sense of what the horizon might look like, and it appears this derivation, using the same STP conditions, arrives at an imaginary number due to r_E/r_R being greater than 1. Do you think this is a mis-application of this method, or can we perhaps conclude that refraction under normal circumstances would not increase the distance one sees, but rather limit it with a sufficiently large world radius. (refraction arc radius being smaller than world radius). I'm not sure modeling the refraction path as a circle arc in this case would be proper. Great explanation of the derivation of this formula. I'm interested to know if you think using the increased value for the radius of the earth is also valid for calculating the height that is hidden below the horizon ?